The music theory text that students read and understand. The book that set the standard for orchestration texts. Written by a renowned composer whose works have been performed by major orchestras around the world, The Study of Orchestration is the only text that explores the characteristics of orchestral instruments and shows students how a master composer approaches orchestration. The Fourth Edition invites students to experience the instruments through online audio and video recordings and now offers more coverage of writing for band. The Study of Orchestration is accompanied by comprehensive audio and video recordings—featuring musicians at the Eastman School of Music—illuminating the techniques students encounter in the text. Access to the audio and video recordings is included with each new copy of the text at no additional cost, and access is good for 360 days. 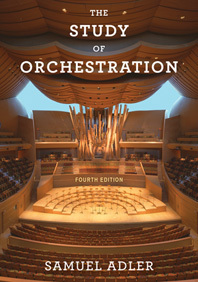 The Fourth Edition includes a masterful overview of every instrument and its techniques, a reference that students will use every time they arrange or compose. Every technique is illustrated with examples from the literature, and a groundbreaking audio and video package allows students to hear and see every instrument. This edition also offers updated coverage of percussion instruments and a new section on the accordion. The Study of Orchestration is the only text that connects information about instruments to what students do as composers and arrangers. This new edition of the text and workbook offers additional coverage of music for wind ensemble. Orchestration in Action sections at the end of each chapter feature master composer and teacher Samuel Adler presenting his own compositions and demonstrating how to orchestrate. Robust media package provides students with an abundance of review and self-assessment opportunities. The Fourth Edition offers new and simpler assignments accessible to students with a range of skill levels. The workbook offers more than enough material for any orchestration class, so instructors can select the exercises that best suit their students' needs.